My transition from the skibob riding technique over to freestyle / pegger skibike riding was not a smooth or painless process. I found riding my diy skibike "on the pegs" was a knife edge balance the whole time, one slip and I would overload the front ski and before you could say "Matt Hanson" I would be face down eating snow. 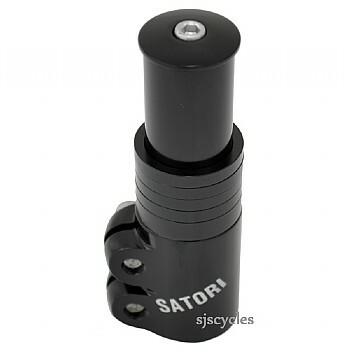 I was advised by Wayne Richards to install one of these Satori stem risers to put an extra few inches height on my handlebars. The result was instantaneous and deeply satisfying, there was still a knife-edged element, but now my skibike's skis were giant knives spreading gooey butter onto warm toast! Installation takes only a few minutes and the kit came with a selection of spacers, top cap and long bolt for the star cap washer. None what so ever, it is a tired cliche, but this item "Does exactly what it says on the tin"